Mushrooms are a wonderful superfood. With a nice savory taste that goes well in lots of dishes, there may also be lots of health benefits to eating them regularly. While other cultures have suspected as much and incorporated them into everyday dishes, mushrooms aren’t as celebrated as they could be here, and certainly aren’t eaten as often or with as much variety. If you enjoy mushrooms, here’s another reason to eat more: according to new research, they are high in antioxidants associated with fighting aging, and the free radicals associated with age. More a source of protein, mushrooms aren’t particularly nutrient dense. Their previous known health benefits aren’t as nutrient focused as they are on how mushrooms manage to stimulate the immune system, which may support health in a number of ways; one study found that maitake mushrooms helped boost the immune system’s first line of defense. And that increased immune activity may help against pathogens as well as other forms of diseases. 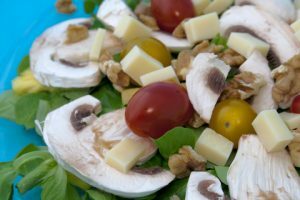 In addition to that immune activating power, mushrooms may be the best source of the antioxidants ergothioneine and glutathione, which the body uses to help fight the free radicals that cause aging. The immune boosting powers of mushrooms was already enough to make them superfoods, these high antioxidant levels are just another reason not to miss out on the potential health benefit of mushrooms. Get more mushrooms in your daily diet without having to rewrite recipes or take up a foraging hobby: start each day with Maitake Beta Glucan Extract, which combines Maitake, Shiitake, and Reishi mushrooms into one supplement. All three mushrooms are known for their health supporting benefits, and can be very expensive or hard to find as a result, but you can get them easily and reasonably with Maitake Beta Glucan Extract. Supplements are an easy way to make sure that each and every day your diet is packed with superfoods. Make everyday a little bit healthier with the immune boosting support of mushrooms. Previous post: Is It Strep, or Just Winter Allergies?